The Dogpatch dwellers' favourite Sushi spot, Moshi Moshi will start serving dinner on Sundays from May 4th. 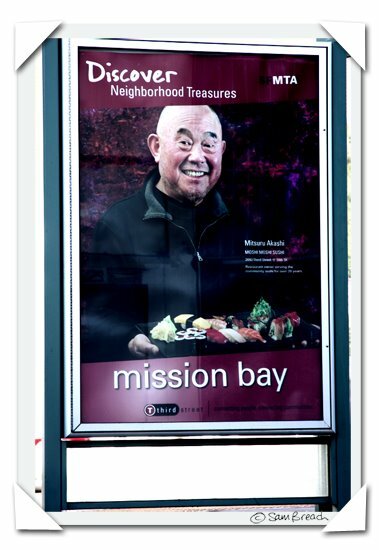 This news was given to customers this week by the restaurant's owner, pictured above on a Third Street T-Line poster, and lovingly known to the locals as Mits. Just look at that smile! Mits is perpetually a gracious host. It is one of those rare restaurants in that everyone, staff and the varied mix of customers alike, are always in a friendly, happy mood. Maybe it's because, from time to time, Mits will offer a gift of some free sake, a random display of hospitality that is not just reserved for regulars. On Tuesday I witnessed a group of four huddling inside the doorway perusing the menu and uhm-ing and ahh-ing over whether they should eat their dinner at Moshi Moshi. Finally they decided no, apologising that they had changed their mind. Without showing disappointment or even trying to persuade them otherwise, Mits simply insisted they should join him for a cup of complimentary sake whilst they wait for their cab. Witnessing his sweet gesture gladdened my heart. Moshi Moshi is a truly welcoming spot that is long established in the recently gentrifying neighbourhood of Dogpatch. Mits isn't resting on his laurels, however and over the years we have been seeing gradual and welcome improvements that can mean a visit can still have its surprises - even for those who have been there perhaps over 50 times. The outside patio has been spruced up, twinkling star lights have been hung from the windows, the addition of a simple but stylish drape has made the entry-way more welcoming and in the last couple of weeks soy sauce is now being presented in dedicated vessels instead of the bottles they came in. The menu, too, always has something new to discover, especially when you consider the constantly changing specials board. Drinks-wise, a wider range of sakes, and a flight has even been added, cocktails are now making a mark and top shelf liquors like Hangar One are available too. From the food menu, I have my personal favourites, depending on my mood, but I always have to include fresh salmon in the shape of a sake bomb (less rice, a little ginger). Other edibles often on my own personal radar include the piping hot, crisp shrimp tempura, the small and simple avocado maki, the vegetarian 'sweetheart' with aged tofu and sweet chili sauce or the 'geisha' a spicy tuna maki deep fried in tempura batter and served with a dab of hot sauce, when I need something a little more bold. Fred often has a pork chop salad (double sauce) whenever he feels the need for salad, but his preferred meal at Moshi is simply a serving of their Gyoza followed by... wait for it... a serving of their Gyoza. Moshi Moshi caters for everyone. Old, young, couples, groups, singles, cops, those who fear sushi (Fred & my mum), vegetarians, vegans (I heard that a well-know vegan restaurant had their Holiday party catered by Moshi Moshi), meat eaters, sports fans (they show games on a TV at the bar), USCF workers, students and more. Whoever you are, you'll find a warm welcome at Moshi Moshi. Dogpatch is lucky to have Mits. ?Have you been to Moshi Moshi? What's your favourite dish? I've been going there for lunch for 10 years and went to dinner just the other day for the first time. Much different crowd at dinner, with lots of what look like well crafted cocktails are flowing and the $12 flights of sake are beckoning. I can't get enough of the oyaku donburi, which is rice topped with onion, chicken breast, and eggs. It's a very authentic dish I had in Japan often. Oh that is good news! When we lived in Potrero Hill we went there weekly. Mits is the consumate host, so gracious. My husband is a huge fan of the tonkatsu. I seemed to order something different every time I went (but usu. always a side of sashimi). This post made me smile. Did you have to tell everyone? Kidding! Looks like a little competition is good for the 'hood. So do I have to fight Mits for your attention at our Very Important Date this Sunday?? I have to admit that I did enjoy my visit there. Wish I could join you this weekend!! thanks for the tips corkdork & stefania - new things for us to try. Tshane - I heard about Umi. However, not is it only a walk up a hill for us - it doesn't (from the looks of the menu) cater to the same diversity of people. I don't think I would take a vegan or a fish-disliker to Umi. So, no competition I say, although personally I would like to try it. Fatemeh - you win, doll, despite his smile you are much prettier than Mits. mum - pop on over - you are more than welcome. Have I been there! We used to have the recording studio over the place. We stayed up all night and then would come in bleary eyed for a Sushi lunch. My little girl grew up On Mits Sushi! moved away and glad to know it is still there! blast form the past! Fred and I got there at 8.30pm on Sunday. Sure enough they were packed and they had run out of food and were accepting no more customers. True to his word Mits was at the front door writing out 50% vouchers for use in the future to those who were being turned away. He told us there was a long line when they opened at four. How's that for popularity? !